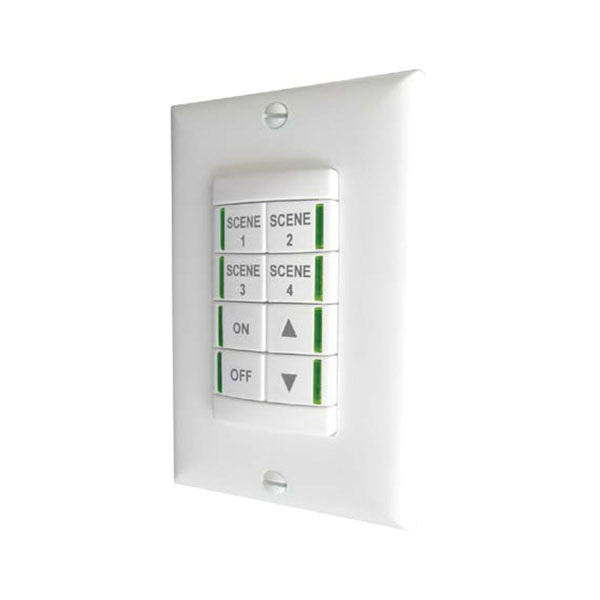 Lithonia Lighting AcuityControls™ nLight® 4-Button Wallpod scene controller in white color, is capable of programming four different type scenes. This controller is remotely configurable and upgradable. Controller in gloss finish, is 1-Gang switch box or low-voltage ring mountable for easy installation. It has two RJ45 ports for added network connectivity. It measures 1.68-Inch x 1.63-Inch x 2.74-Inch. Controller consumes less than 5-Milli-Amps of power. It is ideal for education, government, healthcare, hospitality, manufacturing, offices and banks, religious, retail, warehouses, sports and recreation. Controller operates at temperature range of -10 to 70 deg C. Wallpod scene controller is RoHS compliant.